If you after versatility and you are in a position to spend a little time on your knife sharpening, the whetstone was traditionally the way. However, with the trend for interestingly designed ‘ergonomic’ sharpeners, such as the Warthog V Sharp and the Wicked Edge series, entering the market – new manual devices are providing more control while still being relatively easy to use. 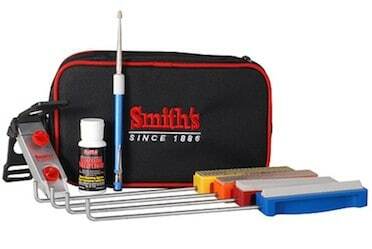 The Smith’s DFPK Diamond Precision Sharpening Kit falls between these two camps. Taking traditional methods of knife sharpening with a slight twist. Firstly, the DFPK is able to maintain all your knives at home, including Asian, sports/hunting and serrated. 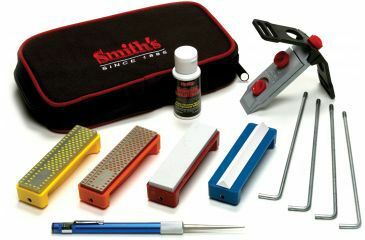 The kit comes with 4 x 1 inch wide Arkansas sharpening stones, a durable and retractable diamond sharpener, and a bottle of Advanced Formula honing solution, also made by Smiths. (The patented formula has anti-rust and anti-corrosion cleaning additives within, and can be used alongside a number of Smiths knife sharpening products). We mentioned that the DFPK was easy to use, well by incorporating a V-lock vice into the kit, any first-time operator is able to maintain the pre-selected angle throughout the entire sharpening process. 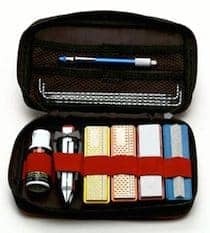 The kit is clearly aimed at those that require knife sharpening facilities, both in the home and out in the field as the DPFK is small enough to be packed away in the supplied fabric pouch. The diamond coated steel rod is basically indestructible, and is designed to be used whenever and wherever you need. Overall a well-designed product that has delivered great results for may satisfied customers. However, if you are unlucky enough to receive a kit that had an issue on the production line, (as some customers have described) you may have a tool that doesn’t work as it should. Which really there is no excuse for. As lubrication is required to use the DFPK, you must apply a few spots of the Smith’s Premium Solution to your selected stone before you begin. This allows any metal and stone particles to float off the stone during the sharpening process. Assembling the kit couldn’t be easier. You just need to mount the T-Bars tightly onto the end of the knife clamp then screw a guide rod into the end of the selected Arkansas stone. The positioning of the blade is very important, as it really does affect the overall sharpening performance. Ensure that the knife is firmly in place before you begin. The angle is selected by placing the guide rod with the required stone attached to it through one of the slots in the T-bar. A 25-degree angle in the upper slot – providing a durable sharp edge for hunting and all outdoor knives. 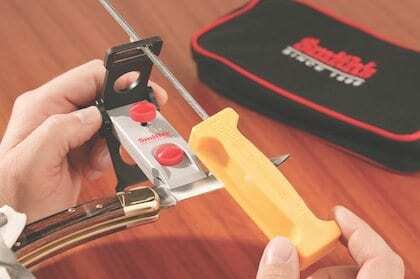 Although Asian knives can be sharpened using the DFPK kit, you will have to settle for a 20 degree angle rather than the preferred 16 or 17 degrees. Which is a significant drawback if you have a lot of expensive Asian style knives in your collection. Watch the video below for a handy demonstration on how to sharpen a knife using the Smith’s DFPK Diamond Precision Knife Sharpening Kit.